Dobrá Tea is Ashland’s new, uniquely authentic tearoom, yielding loose-leaf teas of over 100 kinds from around the world, served in authentic tea ware that invokes age-old tea traditions originating in countries like India, China and Nepal. 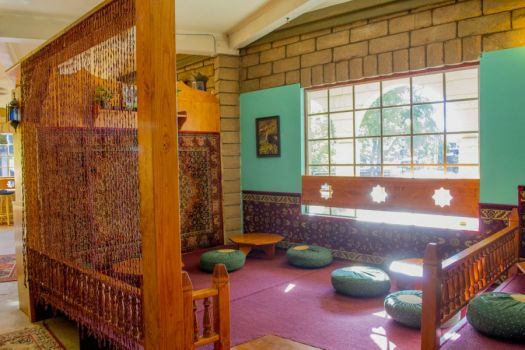 Served in a Moroccan-style tea room, Dobrá Teas are much more of a global and soulful experience than the average American thinks of sitting down to a cup of Earl Grey (though they have that too). 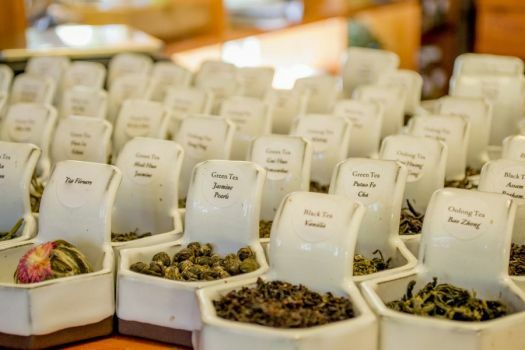 Owners Travis and Nicole Peterson, who just so happened to meet and fall in love over tea, have brought this escape from life’s chaos to Ashland, a town that’s a perfect fit for both spiritual insightfulness and tea-lovers alike. The tea room was co-designed with the founders of Dobrá Tea, which has expanded over the last two decades into handfuls of locations across the U.S. and Europe. Scouting for a perfect space, Travis and Nicole found that the former sandwich shop on the downtown corner of Granite and North Main had an appealing shape that would allow them to have a separate kitchen, from which tea wares of many origins emerge from behind the Brew Master’s bar. Even if you’re not very knowledgeable about tea, Dobrá’s extensive tea menu, with descriptions that appeal to both the logical and poetic sides of the brain, guides tea drinkers through categories like caffeinated or non, hot or cold, and then by a tea’s country of origin. Teas that are most popular include: Darjeeling First Flush for its fresh delivery and flowery aroma, Matcha, which is a powdered green tea that becomes quite thick when hot water is added, rousing Chai in its many forms, Green Tea with its touted health benefits, Shakespeare Tea that is a recipe written by Shakespeare himself, and Staroborshov, an oolong tea that when mixed with a little bit of sugar, ends up looking like draft beer with a frothy head. Tourists and locals alike will appreciate the cold, authentic bubble teas offered, especially with hot summer months coming soon. Dobrá’s authentic tea wares are always changing and are offered for sale, as are teas in bulk, so you can have your own country-specific, authentic tea experience at home. Don’t forget to have a bite to eat while you’re drinking your tea, with the reassurance that all food is gluten-free and veggies are locally sourced. Dishes include dolmas, miso and hummus. In the area of sweets, Dobrá is a true treat because they carry gluten-free yumminess like the flaky Fig Spiral, Superfood Tart, and a divine chocolate truffle called a Medicine Ball because of its blend of medicinal herbs inside a base of coconut oil and almond butter. Take some time for yourself and relax at Dobrá.